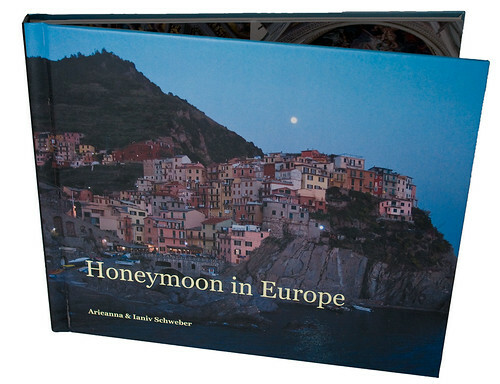 In the end, we have a 160-page book featuring about 450 images from our honeymoon. Some of those images are full page, some arranged into quadrants, and some mixed into patterns. There were lots of templates in the Blurb software to create various layouts. The cover I chose is basically a sticker-type thing that goes over the fabric, instead of the jacket (though the latter has the advantage of jacket flaps). I chose to keep this book just about the images. It was too overwhelming with so many images to choose from to think about putting in a story as well. I had something pretty written for the flaps, but didn’t realize there would be no flaps with this cover style. Kind of a bummer on that. I will definitely be exploring this in future, and would like to create books with more full-page photos, with text, and perhaps with black backgrounds instead of the white. We had no idea what to expect from the first try, but were quite pleased by it! The price was just over $100 plus shipping for the book – not bad considering how many photos there are and that they are full bleed, and many at a large size. The quality was pretty good, with only slightly less vibrant colors than the real photos.